Since I’m neck-deep in senior pictures and family portraits, I’m very grateful and happy to let producer Susan Hurwitz do most of the talking on this entry. But let me just say that the kids made this publicity shoot a cinch. At one point I was so amazed with how quickly they would snap into character, I said aloud, “I love working with such pros!” They probably thought I was playing with them — but I was so dazzled by their performances; they truly came across as seasoned professionals. And thanks to their full cooperation and ingenuity, we accomplished a very ambitious shot list in just over an hour. Miss Saigon is our second “workshop” show (Willy Wonka was the first). Music Theatre International owns the rights to Miss Saigon and is having us workshop a slightly toned-down version of it so they can market it as more age-appropriate to high schools across the country. But the script is very similar to the original, which is great because the show is so compelling. Though the show deals with mature themes (war, ill-fated love, violence, death and destruction), the actual characters are young (16–20), so the material really resonates with our kids. We are bringing in a variety of lecturers (some from UM) to talk about the war in Vietnam, Vietnamese culture, the role of women in occupied countries, Vietnamese history, etc. The kids will have many opportunities to reflect on playing these characters (young prostitutes, American GIs, Vietnamese citizens/soldiers) as the rehearsal period goes on. We will also have a facilitated discussion about the similarities/differences between the Vietnam and Iraq wars in a few weeks. Then, of course there are the technical challenges: creating an atmosphere evocative of Vietnam and war will demand the very best from our lighting and sound crews. And don’t even get me started on that helicopter scene — you’ll just have to come and see for yourself how we’re handling that! I would say 10–11 as a general guideline, as long as the parent knows what the show is about and is willing to talk with the child beforehand in general terms about the show and then be available afterwards to talk, as well. This show provides so many opportunities for parent-child discussion/education — about history, the realities of war, human relationships, racial/ethnic issues, the current war in Iraq. This is a show that will stay with people for awhile after they see it. It’s more than just a few hours of entertainment — not that there’s anything wrong with that! 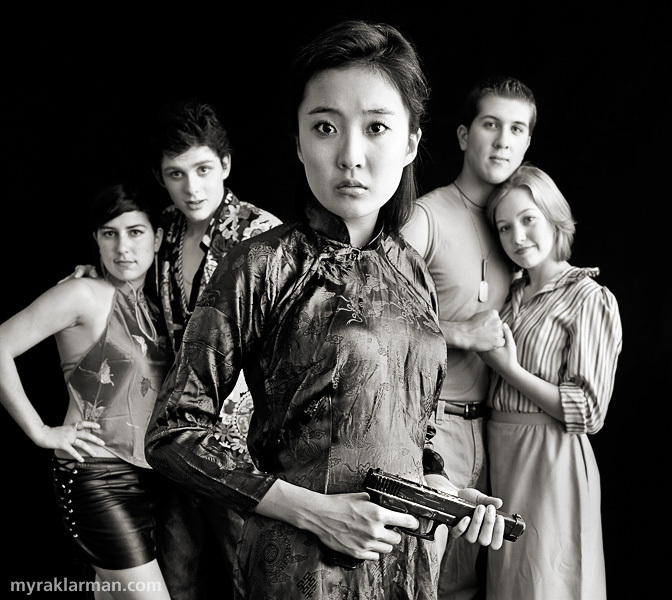 Gigi (Sonya Major), The Engineer (Daniel Mozurkewich), Kim (Ashley Park), Chris (Tim Van-Riper), Ellen (Clare Eisentrout). More info on the Pioneer Theatre Guild and the 2008–2009 season. A love triangle, and eventually, the ultimate sacrifice. These are such expressive photos. Stunning! OMG! These are fantastic! Great job! I’m looking forward to seeing this show. Great work cast & crew! Wonderful pictures of the event! Myra, impressive photographs. Each character emits their story. You were definitely working with pros. The stage production was emotional and “totally awesome”.